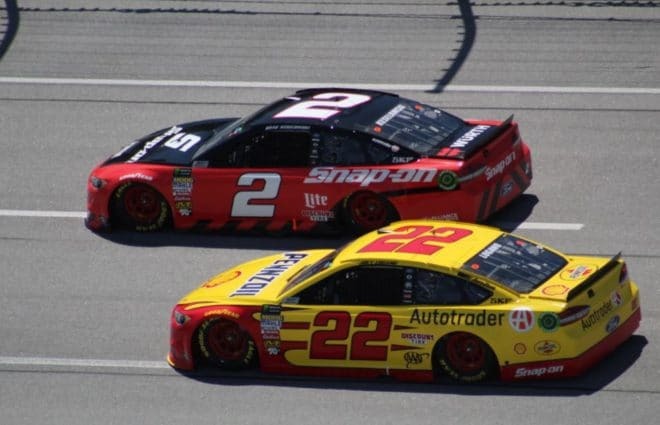 With 15 laps to go in the Monster Energy NASCAR Cup Series’ Ford EcoBoost 400, the championship four drivers were running 1-4, and with 12 laps to go Joey Logano passed Martin Truex Jr. and claimed Team Penske’s second Cup title in six seasons. This was Ford’s first driver championship since 2004 and their first manufacturer title since 2002, winning 19 races in the Fusion’s final season before the Mustang joins the series next year. For the season, Ford won 19 races, Toyota triumphed 13 times, and Chevrolet won four. Truex was second, Stewart-Haas Racing’s Kevin Harvick third, Joe Gibbs Racing’s Kyle Busch fourth and Penske’s Brad Keselowski rounded out the top five. Finishing sixth-10th were Roush Fenway Racing’s Matt Kenseth, Hendrick Motorsports’ Chase Elliott, and SHR’s Clint Bowyer, Aric Almirola and Kurt Busch. Harvick and Chip Ganassi Racing’s Kyle Larson won the first and second stages. There were 18 drivers who finished on the lead lap. Seven drivers led laps – the four title contenders, JGR’s Denny Hamlin, Larson and Front Row Motorsports’ Michael McDowell. There were four cautions, and all 39 vehicles were scored as running at the finish. Between Harvick, Kurt Busch, Almirola and Bowyer, during points-paying events Stewart-Haas Racing totaled up 12 race wins, 24 stage wins, nine poles, 42 top-fives, 84 top-10s and around 3,300 laps led in their tenth season of existence. Most weeks they were the class of the field and would have racked up even more wins if they hadn’t accidentally sabotaged their own or teammates’ chances to win. Harvick averaged a ninth-place finish, Busch 12th, Almirola 13th, and Bowyer 14th, and they finished third, seventh, fifth and 12th in the standings, respectively. While Chase Elliott won three races and finished sixth in the final standings, 2018 was a dismal year for Hendrick Motorsports. Elliott was the only race-winning threat, and only then occasionally, totaling 11 top-fives and 21 top-10s. Alex Bowman finished with an average result of 17th and 11 top-10s, while Jimmie Johnson set a career-lows in wins (none), laps led (40). top-fives (two), and top-10s (11). William Byron won Rookie of the Year, but only managed four top-10s and led the series with nine DNFs. For this section I’m going to include Furniture Row Racing and Joe Gibbs Racing, and combine their stats, because of how close an alliance they shared, and that both of their most recent drivers are now at JGR. Anyway, between Kyle Busch, Truex, Hamlin, Erik Jones and Daniel Suarez, they totaled 13 race wins, 19 stage wins, 14 poles, 54 top-fives, 93 top-10s and around 3,000 laps led. Busch averaged an eighth-place finish, Truex averaged 11th, Hamlin 13th, Jones 14th, Suarez 19th, They finished fourth, second, 11th, 15th and 21st, respectively. Roush Fenway Racing had another rough season this year. Trevor Bayne was demoted to part-time status halfway through the season, Kenseth averaged a 19.9 finish through 15 races, Bayne averaged a 23.9 result through 21 races, and Ricky Stenhouse Jr. averaged a 19.4 finish for the full season, good for 18th in the standings. Between the three of them, they managed five top-fives and seven top-10s, with 13 DNFs, The No. 17 finished 18th in the owner standings, while the No. 6 improved late in the season to settle into 25th in the owner standings. While SHR and JGR gobbled up the headlines, Team Penske was probably the most consistent overall. Logano, Keselowski and Ryan Blaney won seven races, 16 stage wins, four poles, 34 top-fives, 62 top-10s and led around 2,200 laps led. Logano averaged an 11th-place finish, Keselowski 14th and Blaney 15th. Team Penske won the Indy 500, Southern 500, Brickyard 400 and inaugural ROVAL race all this year, which is pretty impressive. Logano won the championship, Keselowski finished eighth in the standings and Blaney was 10th. Chip Ganassi Racing was incredibly inconsistent. Despite Kyle Larson’s No. 42 Camaro being the class of the Chevrolet field for the season, and piling up three poles, 12 top-fives and 19 top-10s, he never won, only managed to finish ninth in the standings and had four DNFs. His teammate Jamie McMurray had just two top-fives in his final year in the No. 1 and eight top-10s, with an average finish of 19th and five DNFs. McMurray finished 20th in the standings. A bitter sweet day to say the least. @loweshomeimprovement took a chance on me and the 48 team back in 2002… thank you for making this kids racing dreams come true. With it being the final race for Lowe’s, Jimmie Johnson broke out the 2002 rookie scheme to celebrate their partnership. The blue and silver just looked excellent, and the design was simple and tasteful. The neon yellow numbers are a Hendrick hallmark, and it’s kind of disappointing they don’t use them that often anymore. This might be one of my favorite schemes of the season. Next year the No. 48 will be sponsored for the full season by Ally Financial, which is fantastic in that it’s a full-season deal, but not great in that Johnson’s car will now likely be a predominantly ugly dark shade of purple – purple race cars can look really good if they’re done with the right trim colors (generally silver, sky blue, lime green and orange), but if not, then not so much. The Furniture Row Racing No. 78 was in matte black for its final race, which felt very appropriate and fitting. It’s way too early to make predictions about the 2019 season, but I’m going to do it anyway. By the end of next season, Matt DiBenedetto is running near the top 20 in his first year with Leavine Family Racing, now allied with JGR. Hamlin becomes the team’s fourth driver with the arrival of Truex to the No. 19. Elliott is again a championship contender, Johnson is even more irrelevant, and Daniel Hemric uses consistency to become the Rookie of the Year. Ryan Newman struggles in the RFR No. 6, while Kurt Busch does well in the CGR No. 1. If Daniel Suarez does indeed go to SHR in the No. 41, he’ll struggle even worse than he did at JGR. Several underdog teams manage to pull off miracle victories either via restrictor-plate upsets or rain to lock themselves into the playoffs. In the NASCAR XFINITY Series, Cole Custer, Christopher Bell and Ross Chastain will be the frontrunners for the title. If John Hunter Nemechek is able to run full time, he’ll be a contender, too. In the NASCAR Gander Outdoors Truck Series, Kyle Busch Motorsports continues to duel with GMS Racing for series dominance, with ThorSport Racing running third. Tags Front Row Motorsports Joey Logano Kevin Harvick Kyle Busch Leavine Family Racing Martin Truex Jr.
Jimmie won’t win another race. NASCAR again goes to a lighter car with less hp, a combination Jimmie has shown his whole career, he cannot drive. It’s sad, he has two years left on his contract and he’s going to finish his career the way DW did. Just not as long. Chad will really help William next year because William can drive the lighter cars.